Tillerson: Defeating ISIS 'No. 1 Goal' for U.S., But Others Should Do More : Parallels Secretary of State Rex Tillerson is hosting officials from 68 countries to discuss how best to take on ISIS. "As a coalition we are not in the business of nation-building or reconstruction," he said. 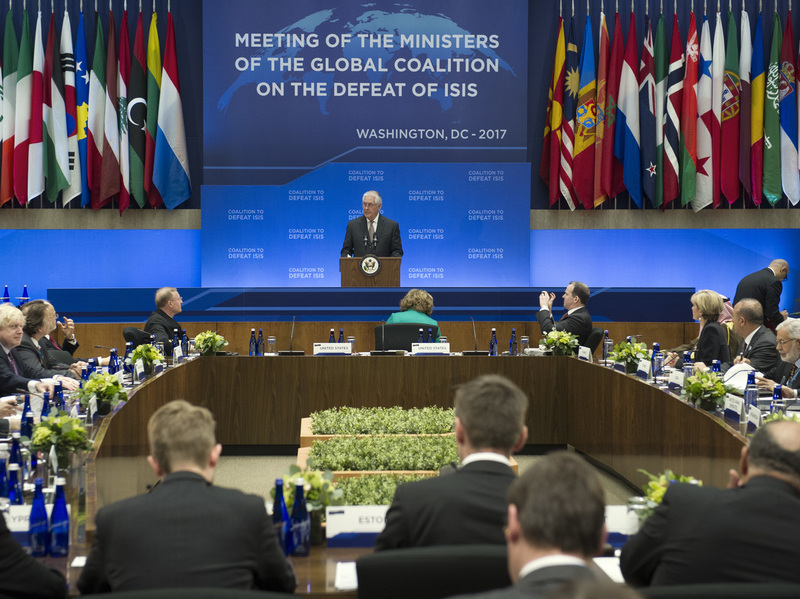 Secretary of State Rex Tillerson speaks Wednesday at the meeting of the Global Coalition on the Defeat of ISIS in Washington. Top officials from the 68-nation coalition are looking to increase pressure on ISIS. At the State Department on Wednesday, officials from 68 countries and organizations gathered for a two-day summit to coordinate plans to fight ISIS. This was the first full meeting of the Global Coalition on the Defeat of ISIS since 2014, and a chance for the Trump administration to flesh out what it wants to do differently. So far, it is mainly stepping up a fight that the Obama administration put in motion. But the language is certainly different. While the Obama administration used to talk about the need to "degrade and destroy" ISIS, the Trump administration speaks only of destroying and defeating the group. "Degradation of ISIS is not the end goal. We must defeat ISIS," Secretary of State Rex Tillerson told the gathered officials. "I recognize there are many pressing challenges in the Middle East, but defeating ISIS is the United States' No. 1 goal in the region." Iraq's prime minister, Haider al-Abadi, said the coalition's goal is not to contain ISIS but to "decimate" it. President Trump used to tout his secret plan to defeat ISIS on the campaign trail, but officials gathered for this week's meeting say they have yet to see it. The French foreign minister, Jean-Marc Ayrault, says administration officials at the conference told him they need more time to finalize a plan, though he says Defense Secretary James Mattis spoke of threats emanating from the ISIS-held Syrian city of Raqqa and the need to act quickly. Ayrault says France has been advocating for that for a while. Tillerson spoke in a conference room decorated with flags from the coalition members and huge banners saying "Defeat ISIS." Tillerson says the U.S. and its partners are promising more than $2 billion this year to help areas that have been liberated from ISIS in Iraq and Syria. At a time of massive budget cuts to his department, though, he also made clear that he is counting on others to do more. Tillerson pointed out that the U.S. provides about 75 percent of the military resources in the fight and a quarter of the humanitarian resources. "As a coalition, we are not in the business of nation-building or reconstruction," he said. "We must ensure that our respective nations' precious and limited resources are devoted to preventing the resurgence of ISIS and equipping the war-torn communities to take the lead in rebuilding their institutions and returning to stability." The secretary said in Iraq, the coalition will focus on clearing land mines and returning water and electricity — while the Iraqi government will take the lead in rebuilding. Syria, though, is a different story. The key players there — the Syrian government and its backers, Russia and Iran — are not part of this anti-ISIS coalition. Tillerson offered only some broad hints about next steps there. "While a more defined course of action is still coming together, I can say the United States will increase our pressure on ISIS and al-Qaida, and we will work to establish interim zones of stability to allow refugees to go home," he said. Trump has talked about possible safe zones in Syria. That may require more cooperation with Russia — and with Turkey, which opposes U.S. support for Kurdish forces that are fighting ISIS.